Serve these as a nice, light lunch or brunch entré or as an appetizer for a larger meal. Note: You can do steps 1 and 2 up to several days ahead of time. Store the prepared artichokes in a tightly covered container in the refrigerator, and let them come to room temperature before stuffing and serving. Trim the artichokes, and steam them for about 35 minutes, or until the leaves come out readily when pulled gently, and the bottoms can be easily pierced by a knife. 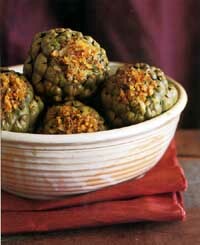 Drain the artichokes by placing them upside-down in a colander, and cool until comfortable to handle. Grab hold of the central leaf cluster (at the tip) of each artichoke and yank it out. Reach into the cavity with a spoon, and scrape out and discard the choke. Heat the olive oil in a medium-sized skillet. Add the onion and salt, and cook over medium heat for about 5 minutes or until the onion begins to soften. Add the wine and cook for another 5 minutes. Add the garlic, bread crumbs, thyme, and mustard, and continue to cook for another 5 minutes, stirring frequently.